“Subverting and integration corporate systems for educational purposes” was the title of the session I facilitated at the CETIS 2010 conference earlier this week. There’s some blurb on the website about the session, but my underlying thinking around the session was to bring together people to discuss the many ways that institutions have to not just subvert and integrate corporate systems to fit educational needs, but also, and perhaps more importantly how to subvert and integrate users and data to meet a range of needs and stakeholders. My primary thoughts around this stemmed very much from the JISC Curriculum Design programme where we have seen a range of solutions from completely corporate (e.g IBM, SunBanner) to more ad-hoc integrations of a range of systems including Sharepoint. Almost half of the Design projects are using Sharepoint to some extent. At the same time the work in the JISC DVLE programme is looking much more at integration of systems and not providing flexibility to add-in to VLEs etc without having to install major upgrades. To give a range of scenarios I had four speakers give an overview of their institutional landscape – Hugh Davies, University of Southampton; Jim Everett, University of Strathclyde; Sam Rowley, Staffordshire University and Mark Stubbs, MMU. Although all quite different, there were some key consensus points. It’s not the data collection and storage that is the issue – it would seem that most institutions actually do have most of the data they need. The key issue is the sharing of the data in ways that are useful to others. The benchmarking process that the curriculum design projects undertook has been instrumental in highlighting the lack of communication between key stakeholders, and the at times unnecessary duplication of effort which takes place. Each speaker highlighted that creating models and opportunities for discussion around underlying infrastructure has provides means for subversion and integration which go much deeper than the technology itself. As Hugh Davies highlighted, for Southampton is has allowed them to have a debate about the wider educational experience the institution wants to provide – how can the infrastructure support and encourage digital literacies for example? The are also challenging some long held assumptions around openness of data. In Southampton they are now going to make all data open unless there is a very good reason not to. Which is the direct opposite of the current situation where you have to have a good reason to make data open. Jim Everett described the usefulness of having a being able to produce a process model of the key information decision points in the course approval process. Although not an easy task it has now allowed the team to have structured discussions around possible innovations as they can see the whole process. Jim also observed how creating the model highlighted the lack of contact between the people involved. The real interoperability issues lie between human communications not system ones. They are now proposing a data management system to facilitate workflows, and provide access to the data to all stakeholders as and when they need it. Jim also advocated strongly the using of BPMN. Sam Rowley took us on an entertaining “ramble” through the the experiences of the Staffordshire development team in recent years. They are now trying to take a more coherent EA based view of their overall system requirements. Like many institutions Staffs has a number of data silos which have been wired together on a pretty ad-hoc basis as and when needed. In terms of business intelligence, there key system is actually a lady called Sheila, and to quote Sam “if Sheila doesn’t know it, then it’s not worth knowing” ( oh how I wish that were true in my life ). By taking an EA approach Sam also hopes to help alleviate the tension between innovation and operation between his small team using agile development processes and the wider more traditional corporate IT services. Having a larger EA based model should help to reduce some of the tensions between potential lock-in to larger systems and more flexible solutions. Mark Stubbs highlighted how the work of the Curriculum Design projects has help to surface the lack of a some key institutional infrastructure around course information and approval processes. 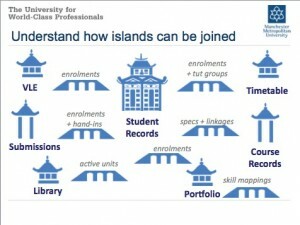 Currently MMU is restructuring the whole of its first year provision for rollout in September 2011. Mark’s team are involved in both the Curriculum Design and DVLE programmes but these projects are part of this much larger, radical change within the institution. Mark used a really nice analogy of Japanese willow pattern as a way to describe understanding the islands and bridges that need to be integrated. Echoing Jim’s point about communication Mark also highlighted the need to sell change to people and to carry stakeholders with you on the journey and involve them in all stages of the process. By introducing a new front end to their sharepoint installation the team increased pressure on their corporate systems to provide feeds to other information sources. Student feedback clearly indicated the types of things students wanted e.g. timetabling and assessment information. In terms of subversion, by producing a new model form (linking to new curriculum database) they have introduced commonality across the institution. Each module will have 5 (and only 5) learning outcomes, which need to be linked to an assessment strategy. There can be no vagueness when filling in the form. After the presentations we broke into groups with the task of describing a “fantasy curriculum management system”. Links to video clips of the feedback from each group is available here. Again a lot of consensus was coming through from the groups – particularly around views to information for different stakeholders such as students, staff etc and the need for data to be able to be re-used in a variety of ways. Copies of the presentations and podscasts of each of the speakers presentations are available on the session webpage.